Mysteries, graphic novel, and two books in translation. Yay. I absolutely loved Book Love which is a wonderful graphic novel sure to be treasured by anyone who loves books. There were several other books I really enjoyed but I think may biggest disappointment was My Name is Lucy Barton. I was expecting a lot and found it didn’t live up to my expectations. I’m currently reading three books I’m almost done with so if only I had spent a bit more time on reading rather than housework I could have finished at least one but that’s ok. I look forward to finishing those hopefully this coming week. I’m excited about April. There are lots of events to look forward to like National Poetry Month, National Letter Writing Month and Dewey’s 24 Hour Readathon next weekend. So here we go, let’s all read wonderful books and have a great month! You had quite a good month! I’m anxious to get to the library and find some poetry collections to read in April. I’ve been on quite a roll with my reading so far this year, and after finishing one book in less than 4 days and giving up on one that’s been on my nightstand FOREVER, I’m happy to be focusing on ONE book for the time being. It’s a re-read, so it’s a bit familiar and not terribly exciting, but it’s still a comfort read. Not sure what I’ll pick up next. That’s always the fun part of this life as a reader, though! Here’s to a wonderful April. I hope the temps aren’t too hot for you! 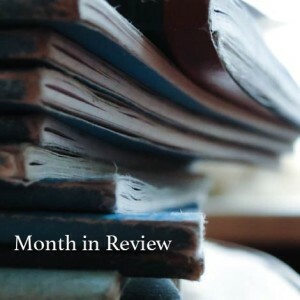 You’ve had a great month of reading, but I’ve been with you on the lackluster blogging month. Too bad about Lucy Barton though. I’ve read that one twice and loved it… almost as much as the follow-up Anything is Possible. Happy April! Looks like you’d a great reading month, Iliana. And I can’t believe it’s April already.